For the daily operation of any salmon beat to run smoothly it is important that all fishing guests read & understand a salmon beat's fishing rules prior to booking which are there 'primarily' for safety reasons and to ensure the enjoyment of all paying guests. In most cases the vast majority of Scottish salmon fishers will have read a salmon beat's rules prior to booking their salmon fishing permit but unfortunately a small minority still don't read or take a salmon beat's 'conditions of let' seriously enough. The minority will turn up expecting to 'call the shots' on pool rotations, express their displeasure at having to wear a mandatory life jacket or will often even completely ignore the Head Ghillie's detailed & highly 'astute' daily fishing instructions as if they know his beat better! Human life is precious and irreplaceable when lost. Do I need to really say anymore but it amazes me to hear of fishing guests that try to object to wearing a life jacket even if the beat rules specify that life jackets are to be worn at all times. What on earth do they think a salmon fishery is trying to achieve other than to keep them 100% safe and spare the broken hearts of their relatives should they not return from their days salmon fishing! A completely wasted argument unless someones head is full of sawdust and sadly it's only a matter of time before the next salmon river tragedy occurs due to anglers who think they know best and refuse to wear a life jacket. If a ghillie is to rescue an angler from the river it makes the task much easier and less dangerous if the angler is also wearing a life jacket. A drowning man will do anything for a breath of air and that can mean pulling his rescuer under too! The Tay can kill even a strong swimmer in minutes if she ever chooses to show her seldom seen 'dark side' and the faster flowing Spey will do it even quicker and that's the bottom line. Stay safe and wear an automatic life jacket at all times when salmon fishing whether it's in a salmon beat's 'conditions of let' or not! It is completely irresponsible for any angler to think they can deal with the sheer panic associated with unexpected lungfuls of freezing river water! On most professionally run Scottish salmon beats some form of salmon pool rotation will be actioned by the Head Ghillie each day to keep the fishing effort fair to all paying guests or give pools a chance to be 'rested' when the beat is less busy. It is not courteous or fair to a Head Ghillie or fellow salmon fisher if an angler displays disappointment at not being allowed to monopolise a specific salmon pool for the entire morning, afternoon or day. Most Scottish salmon fishers understand the basics of salmon beat pool rotation but again a minority don't seem to understand this basic salmon beat operational standard and will complain if they don't get their own way. All salmon fishing beat huts are there to provide shelter and warmth for 'primarily' the paying salmon fishing guests to enjoy their lunch or for a cup of tea or coffee on arrival or prior to departure at the end of the fishing day. Buying a salmon beat permit does not entitle an angler to lay on a fishing hut buffet for their non fishing friends and family whereby the paying guests or the Head Ghillie are made to feel unwelcome in the fishing hut at lunchtime. If an angler wishes to completely take over the fishing hut at lunchtime this can be easily arranged if the angler hires the beat on an 'exclusive use' basis or with prior Head Ghillie permission or by taking an earlier lunch without this 'take over' interfering with other guest's access to the fishing hut facilities. Common courtesy really but again this is often not considered by some fishing guests. You'd better believe that these days with all the social media marketing tools & 'catch statistic' nonsense that all Head Ghillies are competitive whether they care to admit it or not. All of them want to see salmon getting caught on their beats and they will give their very best most honest fishing advice to their guests to enable them the best chance to catch a salmon that can be recorded in the beat's record book & hopefully photographed for social media purposes too! If you think the Head Ghillie is trying to give you information that will diminish your chances of success or you know his salmon beat better then you've got it completely wrong. Trust your Head Ghillie judgement 100% and follow his instructions exactly as issued and watch your 'batting average' soar along with your relationship! 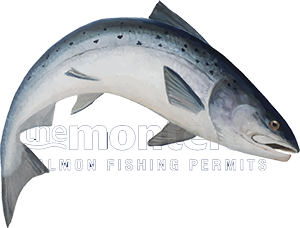 If you've purchased a salmon fishing permit without reading the beat rules and turn up expecting to run the show yourself that day then don't moan, complain or grumble when you're told otherwise!. All Head Ghillies are assuming you've read the beat fishing conditions and expect these beat operating rules to be complied with 100% at all times for your own personal safety and the enjoyment of all visiting salmon anglers. Letting anglers away with bad etiquette on a riverbank hurts the fishery as it will not go unnoticed by other paying guests who are fishing in compliance. It can also can put a life in danger which is completely unacceptable for obvious reasons. The Scottish salmon fishing game has allowed agents to apply a one way 'web visible' style of feedback form which permits a fishing guest to 'sink the boot' at a beat or its Head Ghillie without allowing the fishery the opportunity to formally reply or grade the etiquette of the fishing guests, their skill levels or state of salmon fishing preparedness. This often 'unfair' style of guest feedback will be hurting salmon beats as some Head Ghillies will 'naturally' shy away from dealing with fishing beat rule breaches (to reduce the chances of negative feedback going to their estate office) therefore diminishing the fishing experience of the majority of other fishing guests. Personally I think the Scottish Football Association's protocol of one yellow card as a warning or a straight red with the referees ability to formally report the incident would work well for Scottish salmon beat fishing rules & client safety breaches!